PLEASING THE PALATE: “We wanted to offer the best food at affordable prices. We specialize in unique grilled cheese sandwiches and homemade soups, all with our original recipes, developed over the years.” Nadir Gillani (left) and Karim “Mike” Sopariwalla, owners of the Eatery@Princeton, look forward to welcoming customers to their new restaurant. Nothing tastes better on a cold day than homemade soup and a tasty grilled cheese sandwich. Now, a new restaurant in town provides both, and a lot more too! Eatery@Princeton opened in January at 180 Nassau Street, the former location of Cox’s Market, that long-time Princeton mainstay. Eatery@Princeton is ready to carry on the tradition of an independently-owned establishment providing customers with quality food at affordable prices. Breakfast, lunch, dinner, take-out, and catering are all offered, with emphasis on down-to-earth, home-style cooking. 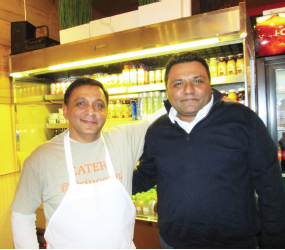 Both owners are originally from India, and Nadir Gillani has a 30-year history in the restaurant business, both in India and the U.S. They are off to a great start. Customers have been coming in since the restaurant opened, enjoying both the food and the relaxed, friendly atmosphere. And for many of the regulars, the earlier, the better. The Eatery opens at 7 a.m., and there are always early risers on hand. The choices are appealing and delicious: among them, omelets, eggs any style, French toast, pancakes, croissants, and bagels. The list goes on: wild blueberry or banana pancakes, and all kinds of egg dishes, including on a roll with bacon, sausage, or pork. Lunch is equally popular, and the expectation of homemade soup or one of the special grilled cheese sandwiches is tantalizing to many customers. Twelve different versions of this old favorite are available, and all have their fans. Among the choices: the Mac Melt, the old fashioned mac and cheese with jack and cheddar cheese; Italian Mafia featuring roasted peppers, tomato, pesto, fresh mozzarella, prosciutto, and thin-sliced garlic; Flying Cuban with sliced oven-roasted turkey, ham, Swiss cheese, cheddar cheese, pickle, and mustard; and the California Melt, with oven-roasted turkey, avocado, cheddar, and jack cheese. Choice of breads include 7-grain, Texas toast, ciabatta rolls, and wraps. Extra toppings are also available. In addition, hamburgers are on the menu, including veggie burgers, and a variety of cheeseburgers. Another important choice at the Eatery is the Fresh Market Bowl, filled with assorted fresh vegetables, brown rice, greens, and choices of grilled chicken, salmon, or vegetable substitute. Also included are shredded Vermont cheddar cheese, crumbled feta, and chickpeas. Dressings and sauces feature Thai coconut curry, organic tzatziki sauce with cucumber, balsamic, Caesar, ranch, honey, and sriracha aioli. Vegetables include roasted beets, honey-roasted butternut squash, charred Brussels sprouts, steamed cauliflower with turmeric; chopped tomato, edamame, chopped Holland cucumber, broccoli, and roasted red peppers. Smoothies are a big favorite at the Eatery; a variety of fruit-based, including strawberry/banana, wild berry, and mango passion are offered, along with the popular vegetable smoothie, with coconut, spinach, carrot juice, and banana. Other beverages include an assortment of juices, such as cold pressed (Naked Juice), and coffees, with espresso, cappuccino/latte, and cafe mocha among the favorites. Also, teas, masala chai, and hot chai latte are available. A variety of cookies, brownies, and fruit platters are popular desserts. Prices at the Eatery are very affordable. Breakfast choices range from $1.95 (egg on a roll) to $7.95; sandwiches are from $7.95, soups from 2.95; and Market Bowls, also from $7.95. Smoothies are $6.95, and coffee from $1.95. There is space for 15 people to sit down, and take-out is very popular with many people, who stop in before and after work. Delivery is also available in Princeton and the area. The Eatery@Princeton is open seven days from 7 a.m. to 9 p.m. (609) 252-1500. Website: www.princetoneatery.com.